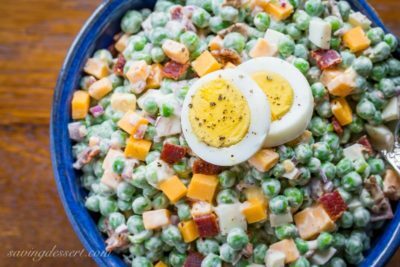 English Pea Salad is a wonderful, hearty side dish loaded with hard cooked eggs, a little bacon, (because everything’s better with bacon) minced red onion, and cheddar cheese all blended together with a creamy dressing. 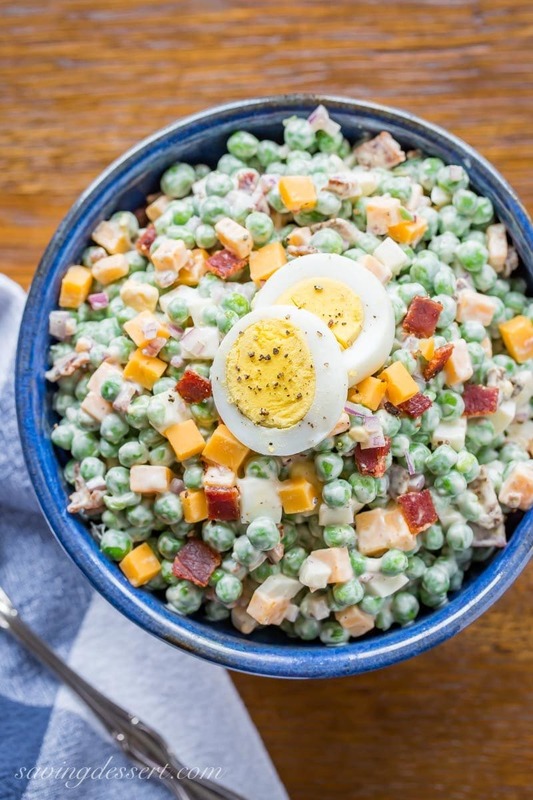 If you happen to be invited to a Easter get-together, summer BBQ, bridal luncheon, baby shower, church picnic or office potluck, this is the salad you want to take along to share. 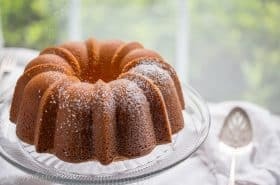 It comes together in a flash and is so easy to make! Plus it gets better after sitting for a few hours so making it ahead of time is preferred. If you’ve only tried pea salad from the mayonnaise-bar at the all-you-can-eat buffet, you’re in for a nice surprise. This pea salad is coated in a tangy dressing but is not swimming in it. 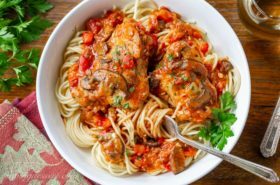 It’s not at all watery or mushy, and the contrasting textures of the ingredients really stand out. Save a few slices of hard cooked egg, diced cheese and chopped bacon for a nice garnish before serving. I like to save the bacon for last, adding it just before serving. It retains it’s nice crispy-crunch while adding that delicious salty bite. You can cut the cheddar into cubes or shred it on a large box grater, either way it works great. Be sure to check the seasoning and add more salt if needed. I tend to go low salt on all my recipes, but this pea salad needs a little. The brand of bacon will make a difference in how much seasoning you need. I used an all-natural uncured peppered bacon with loads of flavor. 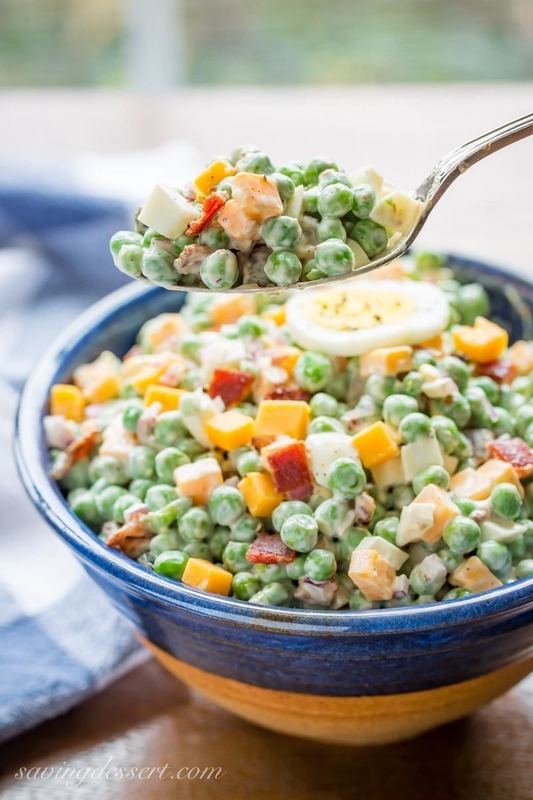 I’ve often wondered if maple bacon would be good in this pea salad, adding that little bit of sweetness … yum! Be sure to use good quality frozen peas and thaw them completely in the refrigerator. Place the bags of frozen peas in the refrigerator the night before making the salad. They’ll be thawed by the time they’re needed the next day. I don’t like to use canned peas for this salad as they’re soft and watery, and dull in color. Fresh frozen peas have a nice snap when you bit into them, great color and a terrific fresh flavor. If you’re worried about eating raw previously frozen peas, drop them in boiling water for 2-4 minutes and remove with a slotted spoon, then drain and cool before adding to this salad. ABOUT ENGLISH PEAS – Peas have been around since ancient times and are believed to be native to Europe and parts of Asia. According to specialtyproduce.com, peas are from the legume family and are rich in vitamin A and vitamin B (particularly folic acid), calcium, iron, zinc, and potassium. They also contain fiber and protein and can help promote healthy vision. You may have heard them referred to as ‘green peas’ ‘garden peas’ ‘shell peas’ and ‘English peas’ as I have done here. ‘Sweet Pea’ refers to a beautiful flowering plant that is not edible so I’m not sure why green peas are often referred to as sweet. English peas are believed to have been cultivated in England in the early seventeenth century. Other favorite edible pea varieties include snow pea and sugar snap peas. 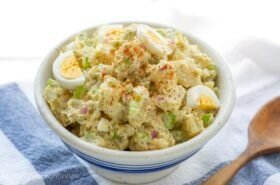 A wonderfully easy, hearty side dish loaded with hard cooked eggs, a little bacon, (because everything's better with bacon) minced red onion, and cheddar cheese all blended together with a creamy dressing. In a 2-cup measuring cup combine the mayonnaise, sour cream, onion, vinegar, sugar, salt, pepper and hot sauce. Stir until well blended. In a large mixing bowl using a rubber spatula, gently combine the peas, hard-boiled eggs and cheese. Pour the dressing over the top of the peas and fold together just until well blended. Refrigerate the salad for 8 hours or overnight. When ready to serve, gently stir the salad and add the chopped bacon. Garnish with additional chopped bacon, cheese and/or sliced eggs if desired. Best served at room temperature. Store leftovers in an airtight container for up to 4 days. It is possible that there is bacteria on the frozen peas. If you are concerned, please blanch the peas by dropping them in boiling water and cook / stir for 2-4 minutes. Remove with a slotted spoon, drain and cool before adding to the salad. English Peas are versatile and terrific in many recipes. If you find yourself with leftover ham, you may want to try this pretty Ham and Pea Soup from The View from Great Island. Sneak some peas into a nice One-pan cheesy potato and green pea casserole like this one from Family Food on the Table. And who can say no to Creamy Pasta with Bacon and Peas from Belly Full? Not me! We add peas to soups, stir fry dishes, stews, casseroles, and of course salads like this Beet, Avocado and Pea Salad which also uses tender pea shoots. Hope you’ll give it a try! Years ago during college I was the brunch manager and salad chef at a prime rib restaurant. They did Sunday brunch and I always made this salad to go on the buffet. Needless to say, it was always the first to disappear. Now you have me craving it! Ha – this salad is always on buffets 🙂 and definately crave-able! Hey Cousin….could the light varieties of mayo and sour cream be used?? Hi Gayle! Yes I think it would still be great and I also think you can use plain yogurt in place of the sour cream. Thanks – hope you’re doing great! My kind of salad Trish, it looks delicious , I love all the ingredients. Happy Easter ! Raw Peas! You don’t cook them? No Sherry I do not – but I know some people will not eat raw peas that have been frozen. You can drop them in boiling water for 2-4 minutes and remove with a slotted spoon, then drain and cool before adding to this salad. I’m with Chris, I could make a meal out of this in a hearbeat! Love the fresh peas, they’re a luxury. This is one of my all time favorite potluck salads. I’ve never seen it with hard boiled egg – love that addition! Thanks Amy! Hope you’ll give it a try sometime. Yes indeed Jennifer! Love all the flavors and textures going on here. Happy Easter to you and your family! I could make a meal on this salad Tricia! It sounds wonderful. I love the hard boiled egg and bacon, yum! Agreed! 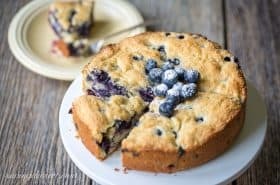 I have eaten this for breakfast, lunch and dinner – so delicious! Always happy when there are leftovers. Have a wonderful Easter Chris! 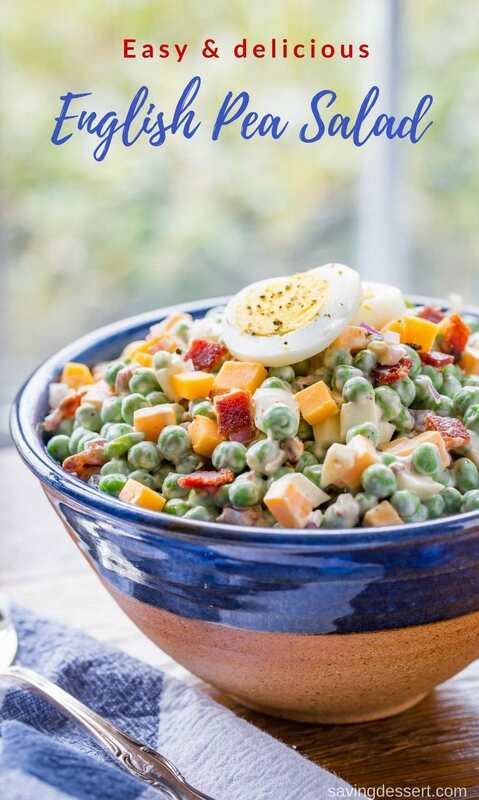 Pea, bacon and cheddar…a fantastic combo! The salad looks amazing, Tricia. 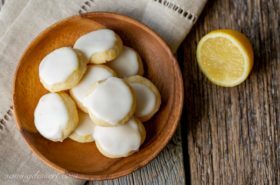 It’s a popular recipe in the US Angie – everybody has a different version. We love our recipe the best! Happy weekend.